Anthony’s is a catering company, which combines over 40 years of food service experience in order to produce the finest parties and events possible. Our trend setting, creatively inspired atmosphere, and décor are unique. From Picnic pleasures, to elegant feast, to memorable weddings, we give consistent attention to detail. Our individually designed, and exquisitely prepared menus are of the highest quality. We hand select our service staff to assure you the professionalism, and peace of mind that you expect from a premier caterer. 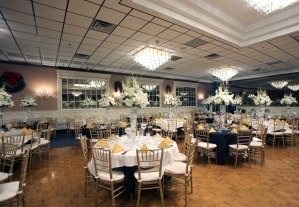 Anthony’s is located in Malden, and has ballrooms that can accommodate 25-500 people. Each room is decorated in its own style and colors. Our objective here at Anthony’s is to provide a menu to suit all your occasions within your price range. We provide you with a menu ranging from buffet to hot dishes that can be a part of a complete sit down occasion or an alfresco meal. In addition to the delicious freshly cooked food Anthony’s can provide the full catering service for your event outside our rooms. This can include chef, waitress, crockery, soft drinks, tea and coffee service, as well as assisting in the hiring of other catering equipment when necessary.